With westerly winds still dominating, sightings have understandably been limited but with winds from the opposite, more favourable direction forecast in a few days time there's some optimism in camp that we might at last see better numbers of migrants! A handful of familiar passerines were recorded on 25th but the 5 Common Scoter past Nouster that day and another 4 past Westness on 26th were the pick of observations from both days. 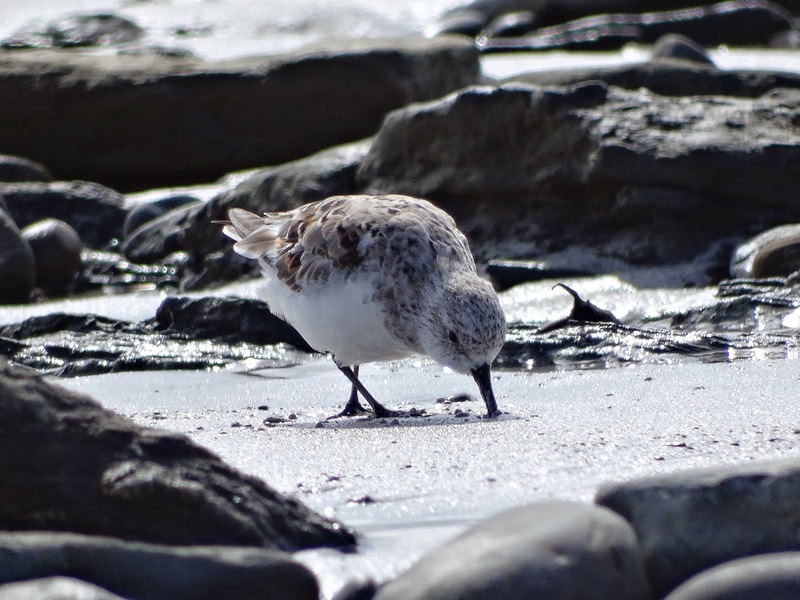 From a reduced census effort on 26th came the first Arctic Skua with a Dunnock and 5 Snow Bunting of note. The 27th was a better day with a few surprises, most notably the first April record of a Sooty Shearwater, which flew west past the sea-watch hide during a hail storm induced half hour sea-watch just before midday! 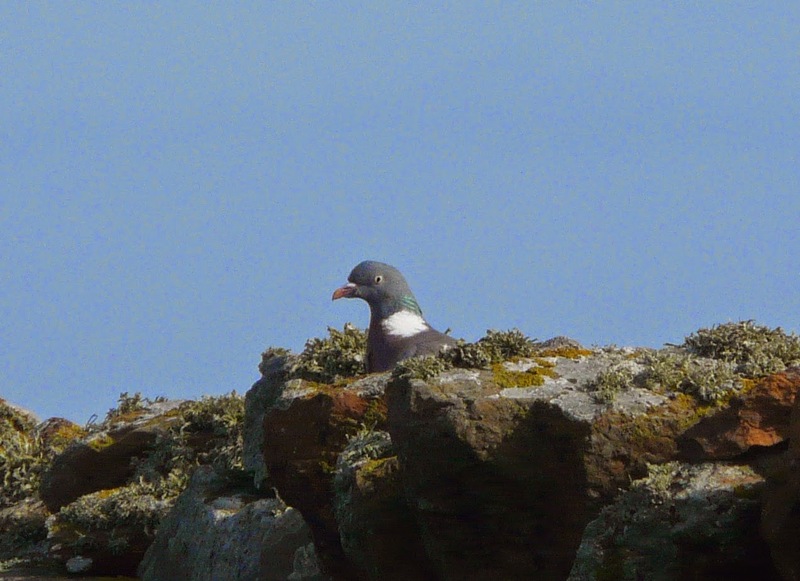 A regular sight between July and October there has been one other spring record from the isle on 26th May 1987 though this individual may have wintered in the north sea with sightings over the last month coming from 3 east coast observatories. Also at the north end, a record flock of 4 (all redhead) Goosanders came in off the sea at the hide before being seen on Ancum Loch a few hours later. 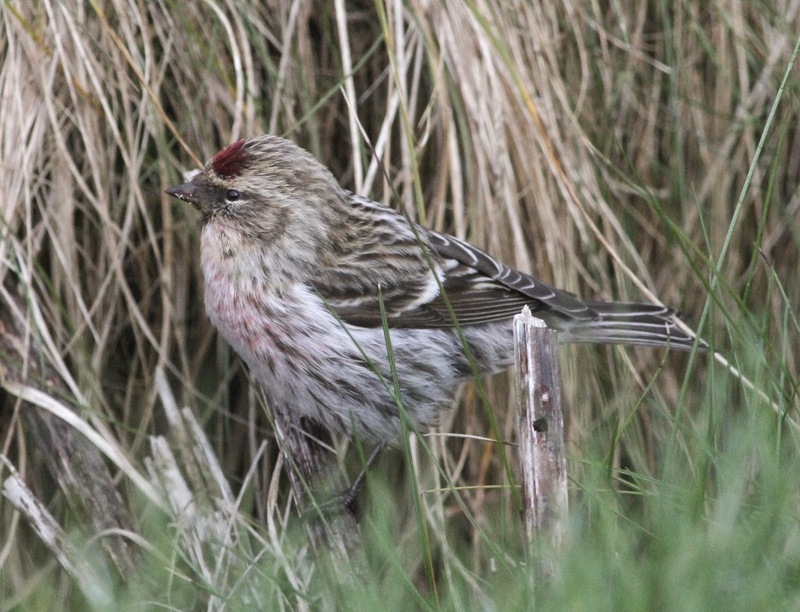 A couple of Common Redpolls (Kirbest/Obs) were the best of the passerines with the lingering Black Redstart, 2 White Wagtails, a Rook and 2 Carrion Crows also seen. 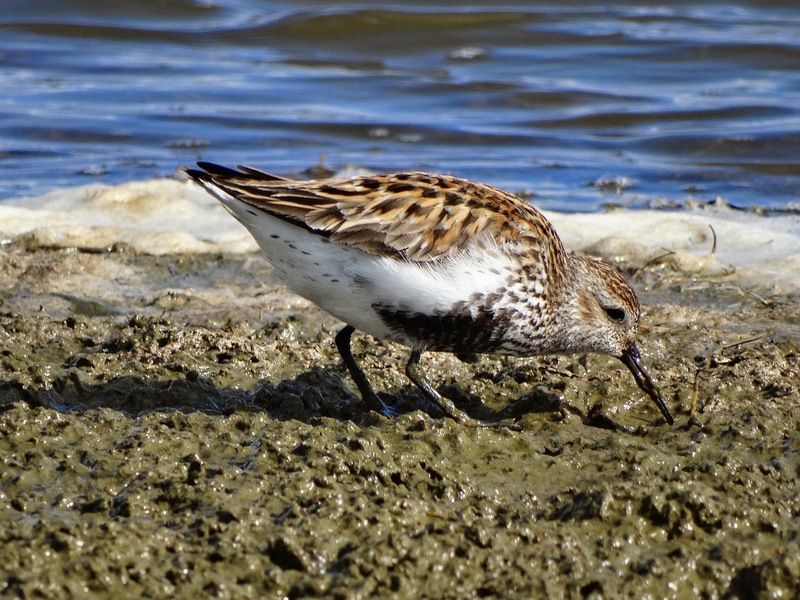 Waders are beginning to build with 2 Black-tailed Godwits, 6 Whimbrels and 292 Turnstones among the species logged plus 10 Great Northern Divers and 14 Red-breasted Mergansers were off the coast and 151 Kittiwakes passed during the brief sea-watch. 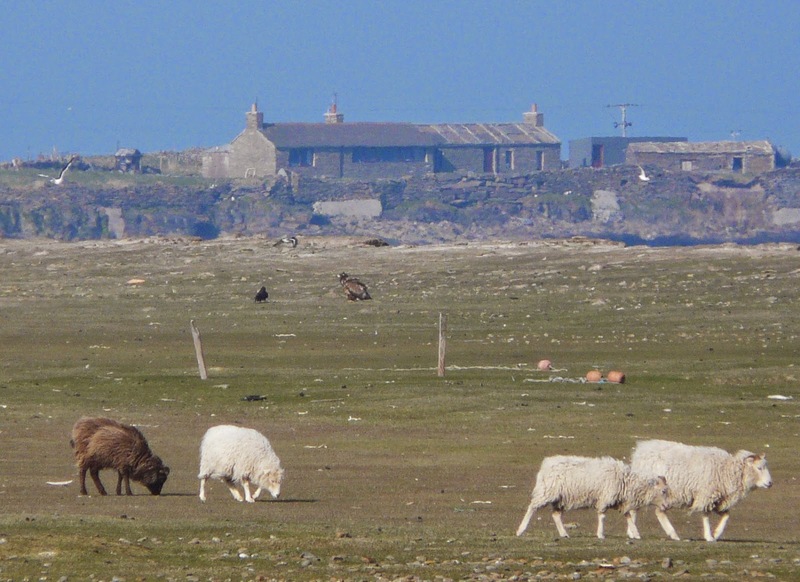 With no sign of any easterly winds, the spring continues at a snails pace-a stark contrast to this time last year when migrants were plentiful. The 22nd brought nothing more than another Sparrowhawk, a handful of phylloscs and the lingering Glaucous Gull though the next day was slightly better with the first Tree Pipit of the year and a Brambling both in Holland gardens while some visible duck movement included 41 Tufted Ducks and a Pochard. Fortunately waders too were less reliant on the wind direction and the first 4 summer plumaged Black-tailed Godwits over Kirbest on 23rd were followed by 2 more at Trolla Vatn on 24th when a Greenshank was also at Gretchen. Regular spells of rain, but no wind that day and a calm sea saw the Black-throated Diver relocated again off the north end of the links with 14 Great Northern and 3 Red-throated Divers also present. 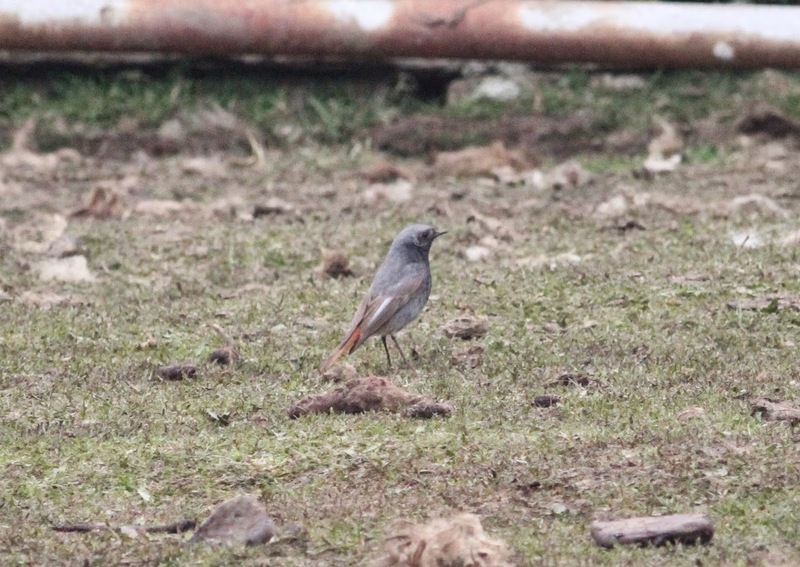 A Fieldfare and Robin were new but a male Black Redstart at Bewan was the same from a few days ago. 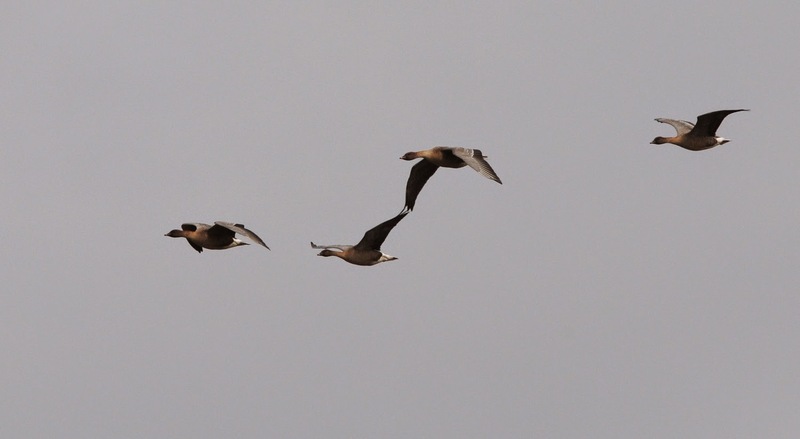 A flock of 18 Barnacle Geese flew north with the 7 wintering birds, the 2 Pale-bellied Brent Geese and a Greenland White-fronted Goose still in the Hooking area. Calm weather on the 19th saw the Black-throated Diver recorded again, this time off Stromness Point with 22 Great Northern Divers in the same area and the 2 Pale-bellied Brent Geese re-located to the north end. New migrants that day included 3 Bramblings and the first Common Redpoll of the year at Holland gardens and a Sparrowhawk, with 2 seen next day when a Jackdaw and 3 Rooks were the most notable birds. A gloomier 21st, with fog drifting in by evening produced a Long-eared Owl which crash landed into the patio furniture outside the Observatory before recovering its senses and showing well in the Nouster area. There was also a Black Redstart, a House Martin, at least 6 Chiffchaffs and a Willow Warbler while a lone Barnacle Goose was likely a new bird and Pink-footed Geese numbers rose to 6. With wall to wall sunshine (well almost) and no wind, the last few days have been rather pleasant so we've even had our meals outside and there's even been talk of Barbeques!! Despite the lack of easterlies, the birds have started to arrive and though there were no real highlights from the 16th, the next day saw a Grey Wagtail (scarce on North Ron) at the Beacon among an arrival of some 82 Wheatears. There was also the first Willow Warbler of the year in Holland gardens, 2 Jackdaws, a Carrion Crow and 16 Snow Buntings on 17th. 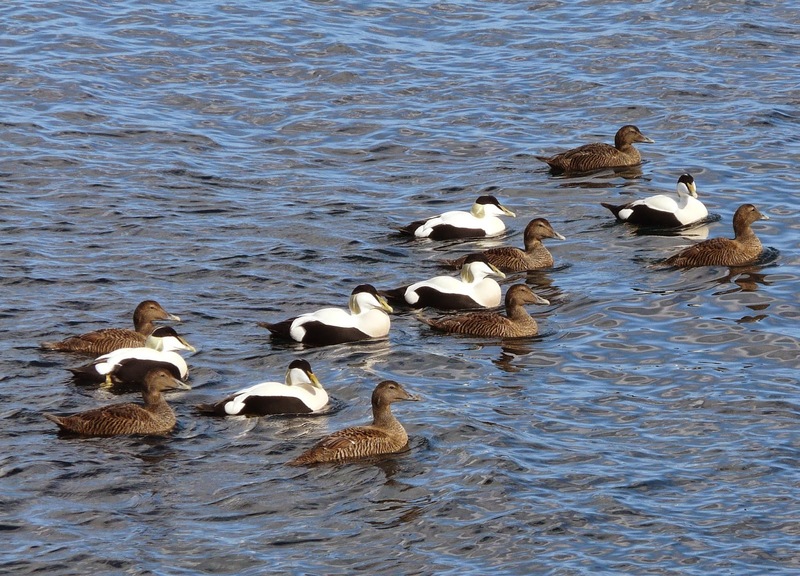 There was an early start that day for the annual Tystie census and 653 birds were counted with the calm seas also revealing 10 Great Northern Divers and 16 Red-breasted Mergansers. That theme continued into the 18th when a locally rare Black-throated Diver was found off the north end of the Links and 18 Great Northern Divers were visible. 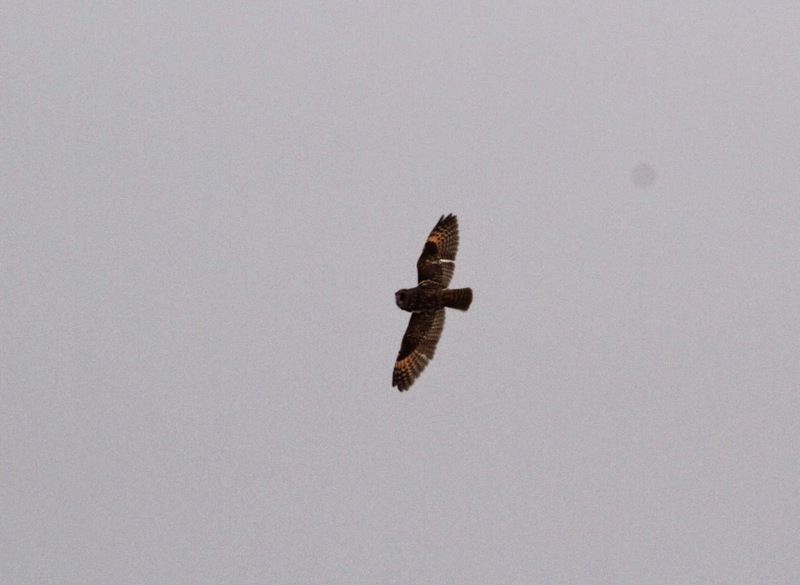 A Common Buzzard (equally rare) then flew south, with at least 2 Sparrowhawks and a Kestrel also recorded. The first 3 Sand Martins came in off the sea at the links (during time spent scrutinising the BTD for something rarer! ), the first Ring Ouzel was at the Mill, a Brambling flew over, there were at least 5 Chiffchaffs and a few more Swallows have been seen plus a Carrion Crow and 2 Collared Doves. Old favourites during the 3 day period have included up to 2 Glaucous Gulls, the Tundra Bean Goose, Greenland White-fronted Goose, 5 Pink-footed Geese (on 18th), the 7 Barnacle Geese and the 2 Pale-bellied Brent Geese were seen again on the latter two dates. Still a bit breezy but 2 Pale-bellied Brent Geese off the coast at Hooking (being less than annual here) were reward for braving the conditions on 14th. The Tundra Bean Goose and a Greenland White-fronted Goose remained throughout but 3 Glaucous Gulls on 15th included a 'new' juvenile with the other 2 being long-stayers having now been present for about 10 weeks! A Black-tailed Godwit, 6 Sandwich Terns and 2 Rooks were also seen but passerine numbers have thinned considerably. The 11th was another sunny day, but with no sign of yesterdays Eagle (and a report of one over Wick) it seems likely to have slipped away undetected last evening. 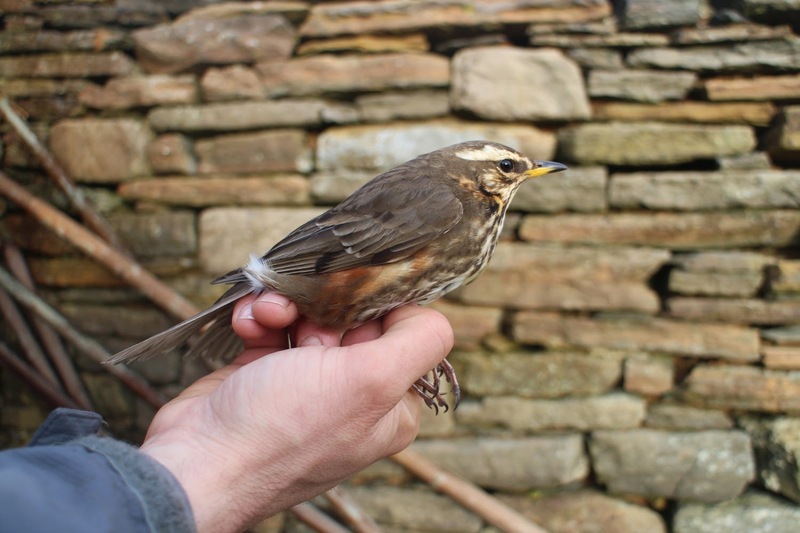 There were some new birds though and it was a marked arrival of passerines particularly Thrushes which were most noteworthy. 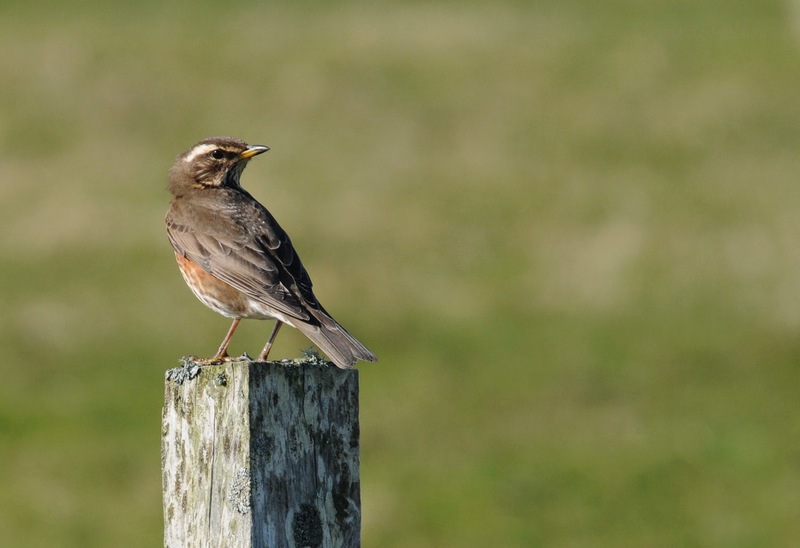 Totals of 155 Redwings, 8 Fieldfares and 2 Song Thrushes were recorded on the former date with gradual reductions over the next 2 days and there was also a widespread arrival of some 67 Wheatears too, with 39 still present on 12th. 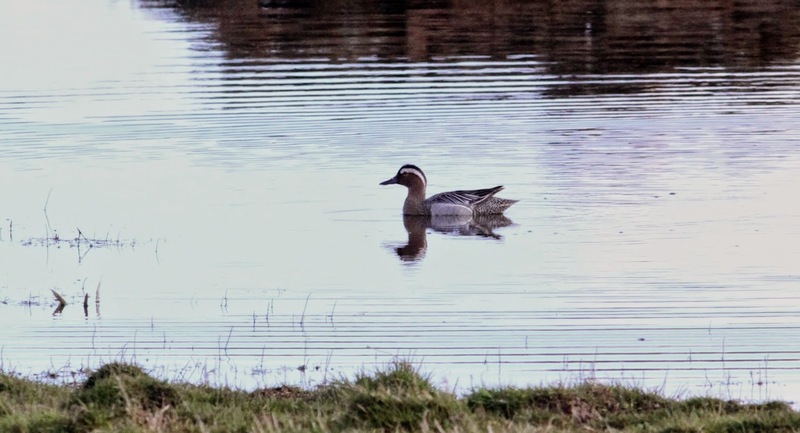 Other new birds on 11th were 2 Pochards (with 1 to 13th), a Sparrowhawk in off the sea at the north end, 2 Merlins (including a new adult male), singles of Woodcock, Black-tailed Godwit, Collared Dove and 2 Woodpigeons. The next 2 days very much saw a return to winter but 24 Pied and a White Wagtail were of note on 12th with a Dunnock, 8 Knot and a Kestrel the best the 13th could offer. Winter birds, seemingly in no rush to leave were the 2 juvenile Glaucous Gulls, 3 Greenland White-fronted Geese, the Tundra Bean Goose although various numbers of Pink-footed Geese such, as the 9 on 11th will have featured some northbound migrants. A beautiful spring day, with wall to wall sunshine and a light south-westerly wind. 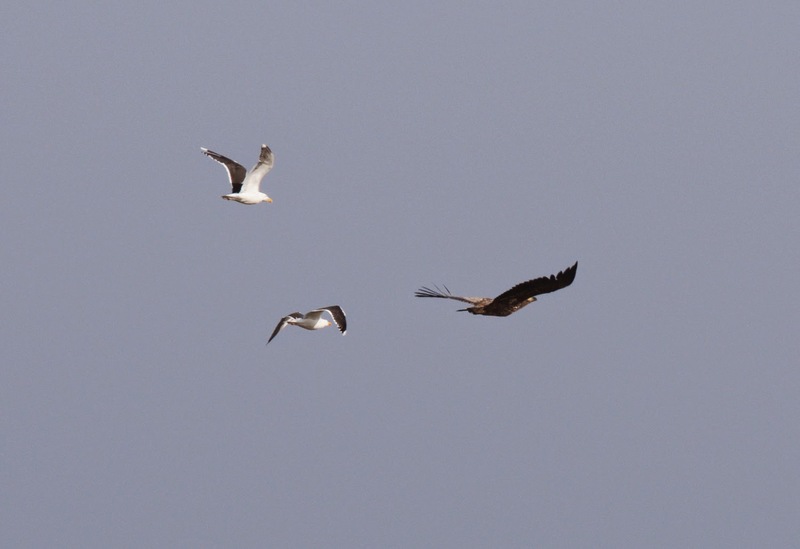 After the morning census had revealed a small arrival of migrant passerines including the year's first House Martin and Dunnock plus 21 Wheatears, lunchtime mutterings of "looking good for a raptor" certainly came true at around 3.45 when every Goose, Wader and Gull in the Bridesness area took to the skies! 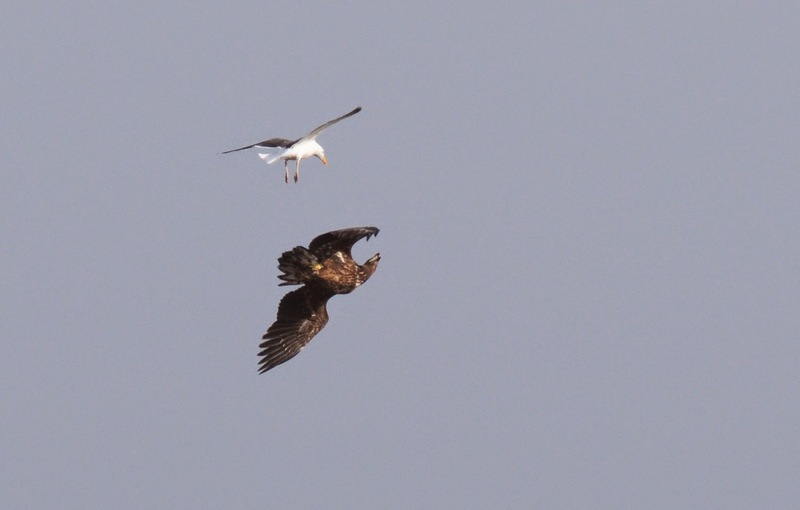 The culprit, an immature White-tailed Eagle was quickly located and that put an end to the days maintenance tasks as the land-rovers were scrambled and the mighty beast was followed around the island for the next few hours, last seen sitting on Torness. 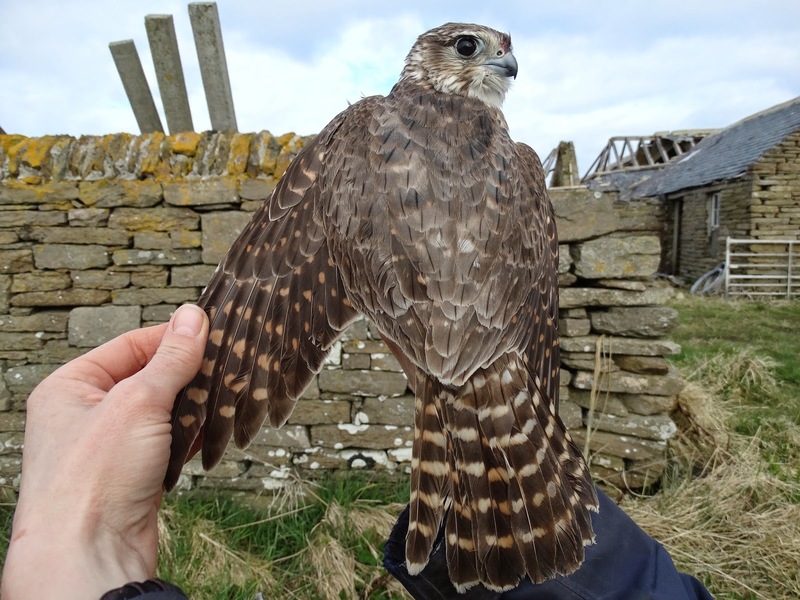 Other migrants recorded were 4 more Swallows during Eagle antics, 36 Redwings, 2 Robins, 150 Meadow Pipits, a Carrion Crow and a Greenshank flew south over the Observatory. 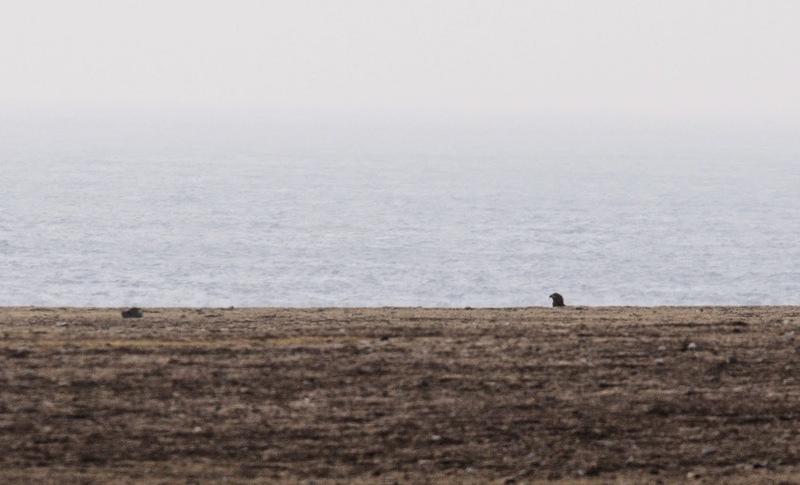 Long-staying Geese included the Tundra Bean, a Greenland White-front and 6 Pink-footed while at least 1 Hen Harrier, a Merlin and 3 Sandwich Terns were also notable. 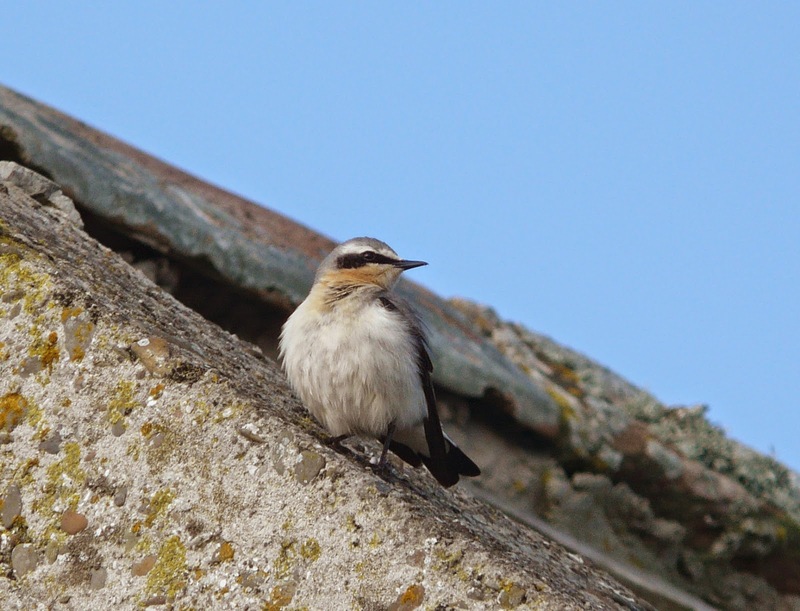 After the past few days, it feels safe to say that spring has arrived on the island, heralded by sunshine and an arrival of 9 Wheatears on the island today. Also new in (and new for the year) were a White Wagtail and a Greenshank on Garso loch. 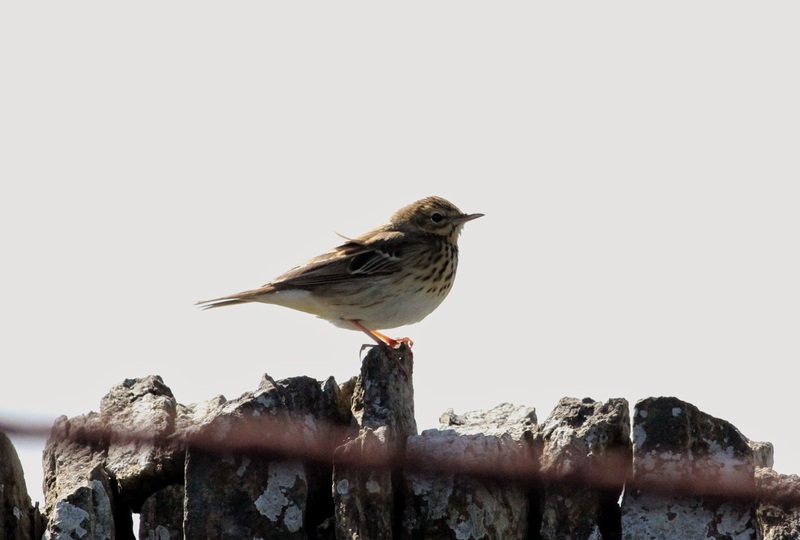 There were particular spikes in counts of Meadow Pipits -- from 56 on the 6th and 83 on the 8th to 252 today -- and Redwings, which have built up from 44 on the 8th to 74 today. Geese are remaining the subject of much attention. On 7th 37 Pink-footed Geese arrived at dusk, leaving only 5 to be found the next morning when a new Greenland White-fronted Goose was discovered. At least three Greenland White-fronted Geese remain on the island, as does the Tundra Bean Goose, seen on the 7th and the 8th. 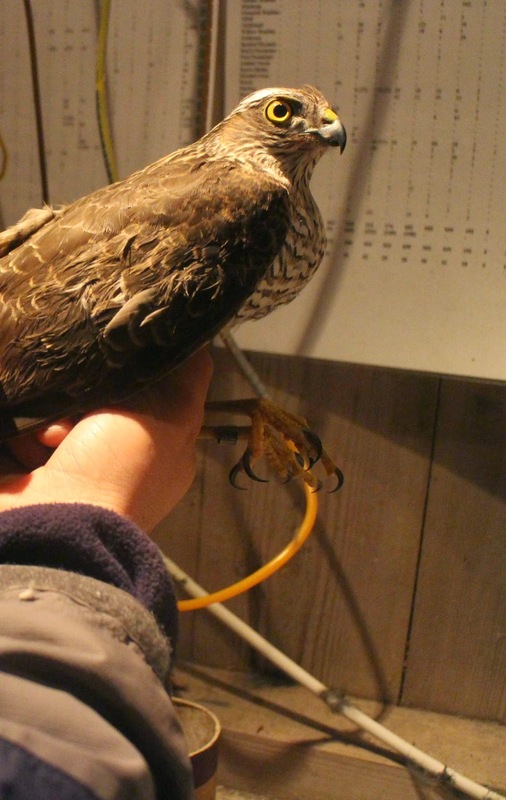 2 Sparrowhawks were trapped on the 8th, and 2 were seen on the 9th as well. 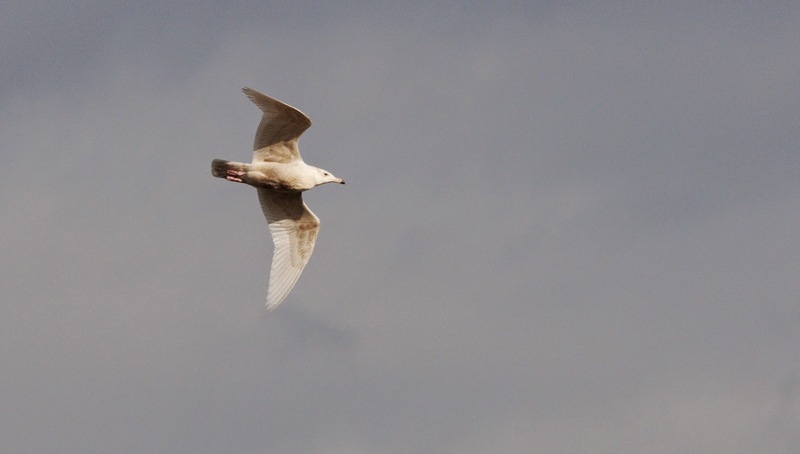 The regular 2 Glaucous Gulls are still being seen frequently, along with 2 Merlin and 2-3 Goldcrests every day. 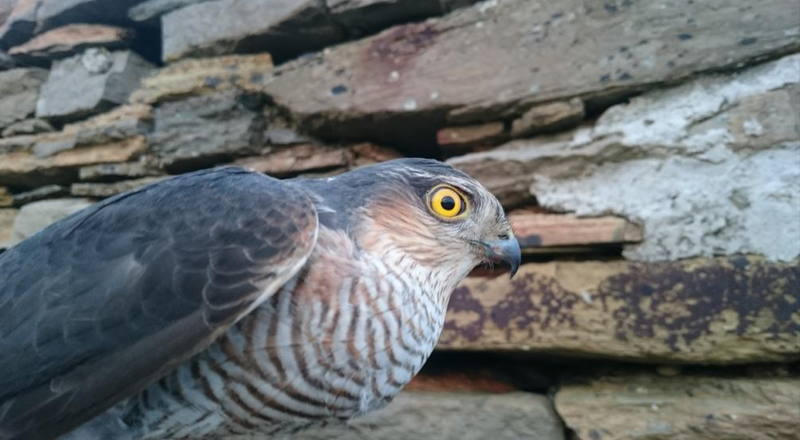 The wind may have briefly swung easterly but it didn't bring the hoped for birds into the island. The most noteworthy birds being the 2 Glaucous Gulls and the 2 Greenland White-fronted Geese being seen daily. Geese counts have peaked with 7 Pink-footed Geese on the 2nd, the Tundra Bean Goose still present on the 5th and the 7 Barnacle Geese still on the 4th. 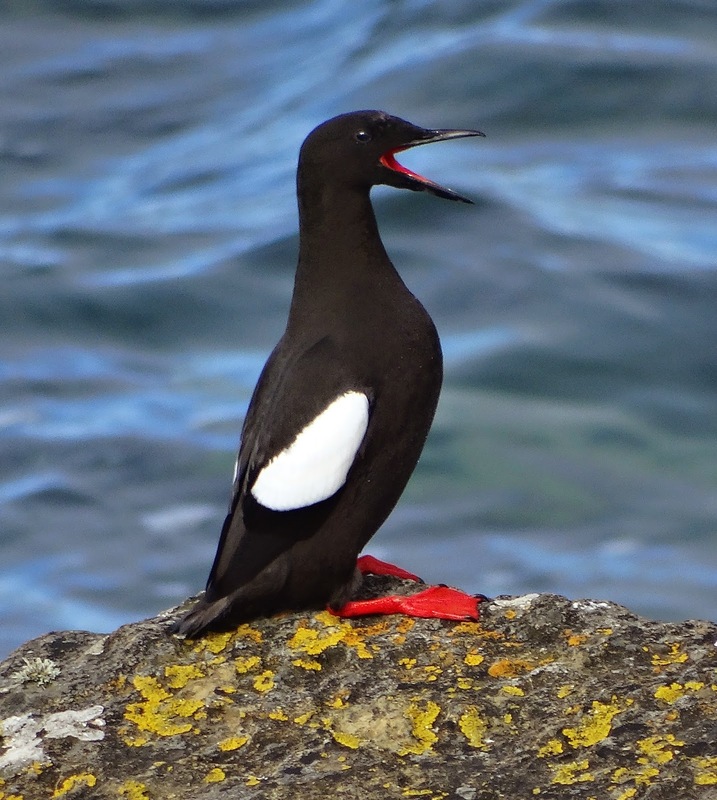 Along with 206 Black Guillemots on the 3rd, 4 Puffins and 2 Harbour Porpoises passed the northern end of the island and were the first to be seen from the island this year. On the 4th 6 Goldcrests were unearthed while a Sandwich Tern was present in Nouster Bay. April fooled us today with a return to snow and hail showers and not much in the way of new arrivals other than a Woodpigeon, 23 Snow Buntings and 4 Goldcrests. 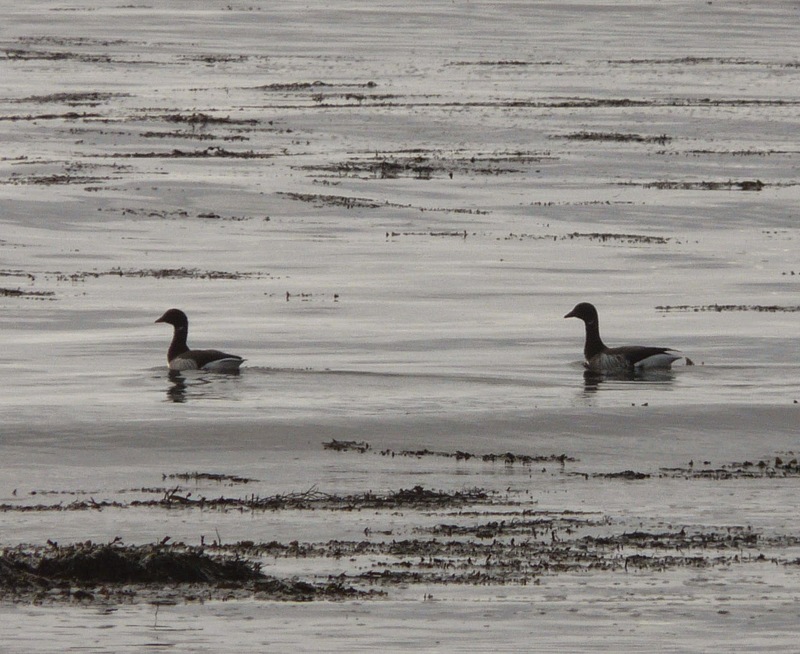 At least two of the three Greenland White-fronted Geese remain. 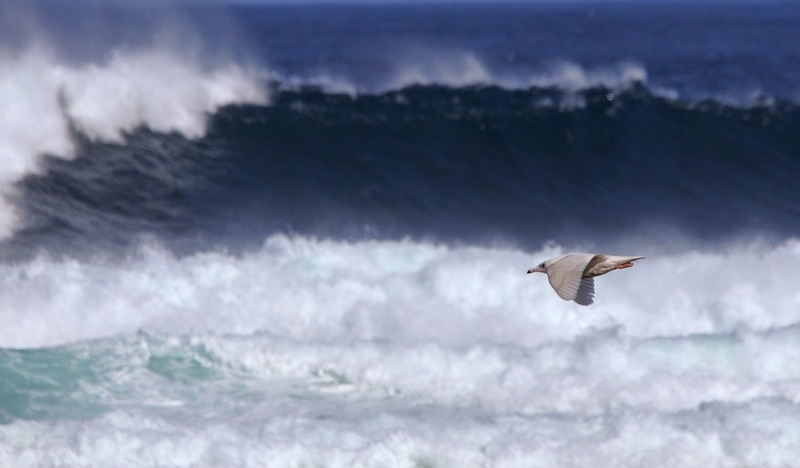 2 Glaucous Gulls were seen on both the 30th and 31st March, with the Tundra Bean Goose still present around the school. The second Sandwich Tern of the year flew through Nouster Bay on the 30th of March, also present on that day were 3 Chiffchafffs, a Black-tailed Godwit, 130 Golden Plover, 2 Merlins and a Peregrine Falcon. The wind is allegedly swinging easterly on Thursday night and we have all available fingers crossed that this time it brings some birds in.